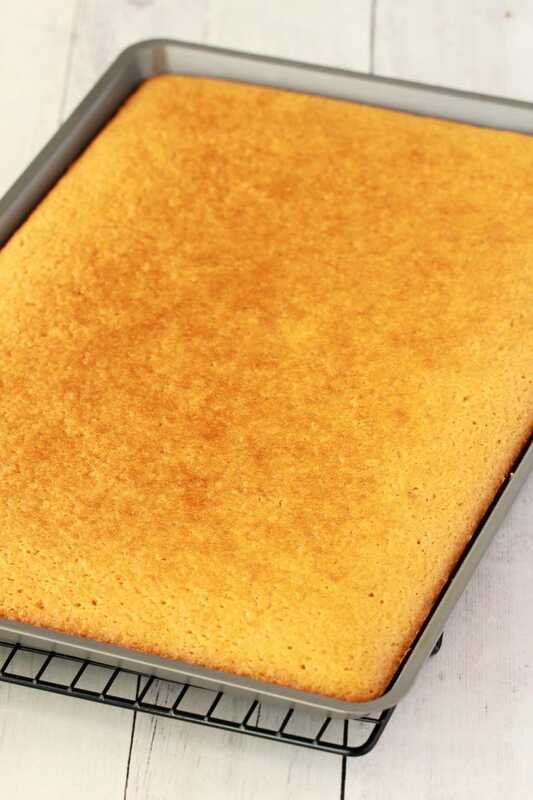 So…I decided on making a vegan vanilla sheet cake because I wanted to make a vegan tiramisu, and after trying various methods for making the sponge layer parts for the tiramisu a sheet cake seemed like the smartest way to go about it. And then the sheet cake came out so well that I was like: well I have to do the sheet cake recipe for the blog! And the tiramisu? Well, that also came out great! I made maybe an odd choice for the frosting. I did a little insta-story of frosting one of the test versions of the cake, with a simple white vanilla frosting, and when I viewed the little video, it just looked a bit…. boring. So on the day of the photo shoot for this, I suddenly decided on a change, not a flavor change, just a color change! But the only colors I had were green and pink. Maybe pink would’ve been better? I dunno. All I know is that green was calling to me on the day so green it was! 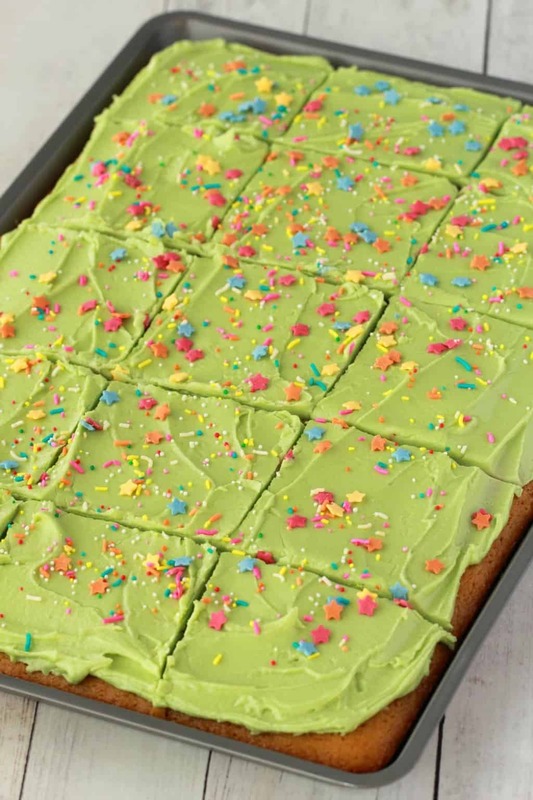 The green frosting with some sprinkles is pretty cute I think, and has the kids birthday party vibes. Well, it’s more those vibes than adult office party vibes anyway! But decorate however you like, and color the frosting (or don’t) however you like. The main attraction is the cake itself! And one of the great things about a sheet cake is that it feeds a crowd. Cutting quite generous slices, this cake gets at least 15 slices. So that’s definitely more than the average layer cake. I used a half sheet pan and my half sheet is 10×15, yours might be 11×15, that’s fine! You can even use a 9×13 quarter sheet pan, you will just have to bake it longer. Keep it covered at room temperature where it will stay fresh for a couple of days or covered in the fridge where it will stay good for up to a week, but fresh is best! 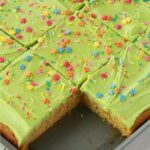 So what do you think of this vegan vanilla sheet cake? Going to give it a try? Let us know in the comments! And please rate the recipe as this really helps us! Thank you! For more sheet cake goodness, check out our chocolate sheet cake and our vegan banana sheet cake. 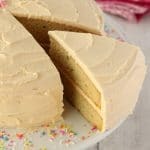 The vegan vanilla layer cake that this recipe is based on is definitely also a winner, and if you love all things vanilla, then you’ll love our vegan vanilla cupcakes too. While you’re here, sign up to our email list as well, you’ll get an awesome free recipe ebook, and you’ll stay updated with all our latest recipe posts. 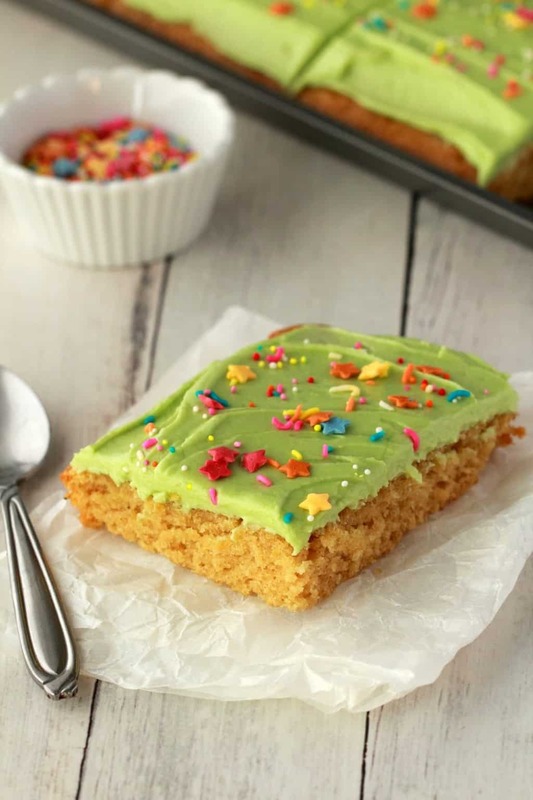 Light, fluffy and deliciously spongey vanilla sheet cake with a velvety frosting and lots of sprinkles! 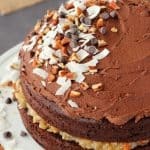 This is the perfect cake to feed a crowd with at least 15 serves, it’s fabulously good and it’s vegan too! Spray a 10×15 half sheet baking sheet with non-stick spray. Set aside. Sift the flour into a mixing bowl and add the sugar, baking soda and salt. Then add the soy milk, vanilla, oil and vinegar. Use a hand whisk to mix in. Be careful not to overmix the batter, just mix until all the large lumps are gone, tiny lumps are fine. Pour the batter out into your prepared half sheet baking pan. Spread the batter with the back of a spoon so that it reaches the corners of the baking sheet and is evenly distributed across it. Place into the oven and bake for 20 minutes or until a toothpick inserted into the center comes out clean. 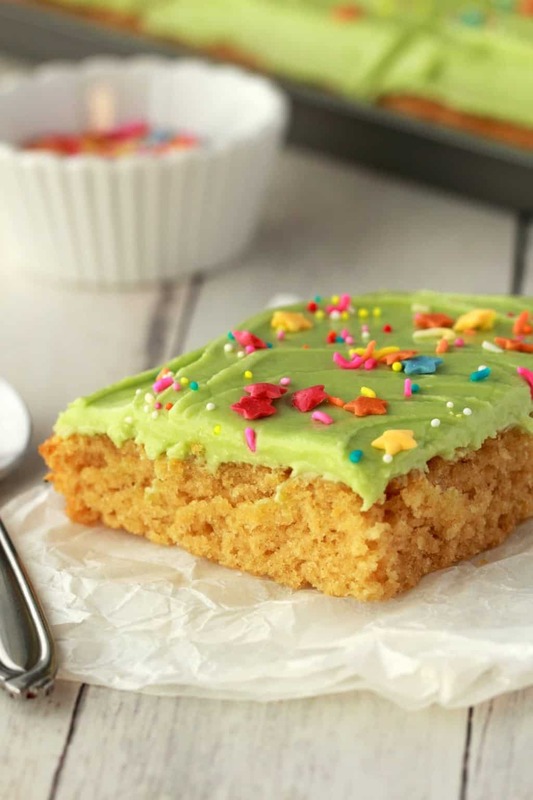 Place onto a cooling rack to cool completely before frosting. Prepare your frosting by adding the powdered sugar, vegan butter, soy milk (see notes), vanilla, and food coloring (if using) into the bowl of an electric mixer. 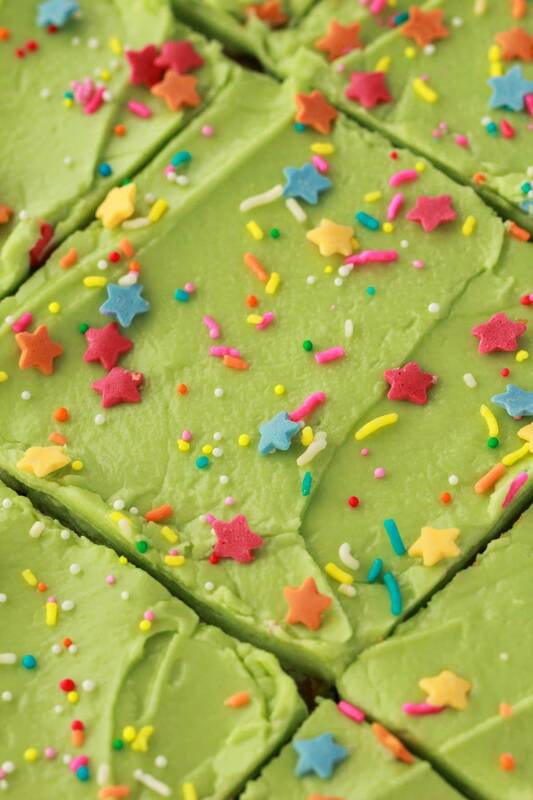 Start at slow speed and gradually increase speed until your frosting is thick and smooth. 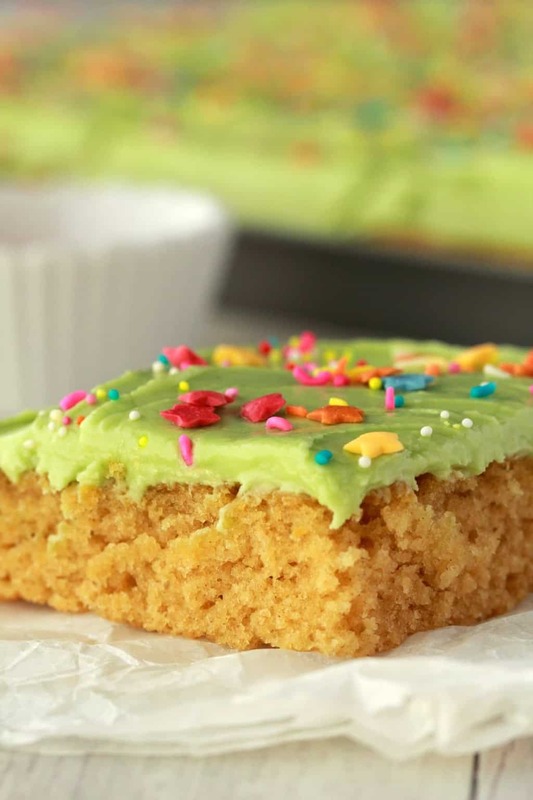 If your frosting is too thin, add more powdered sugar, if it’s too thick, add more soy milk a drop at a time until it reaches the right consistency. 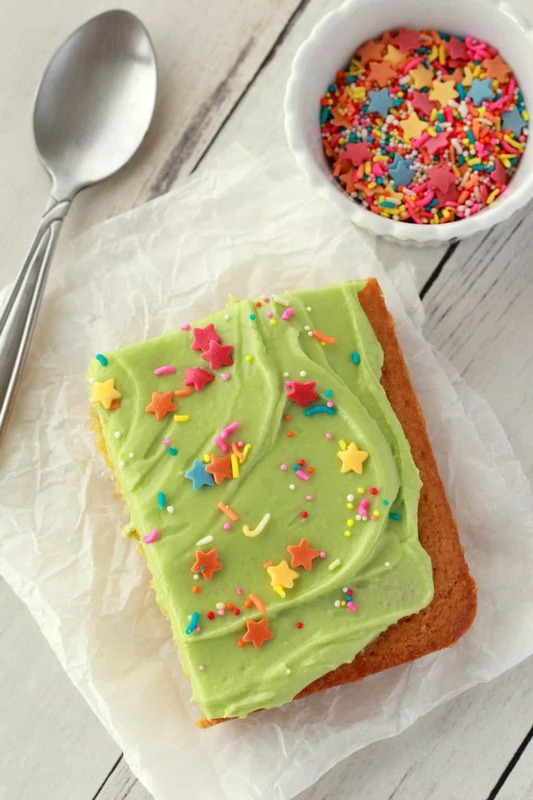 Frost the cooled cake and decorate with sprinkles. *You can use any vegetable oil, such as canola oil, if you prefer. 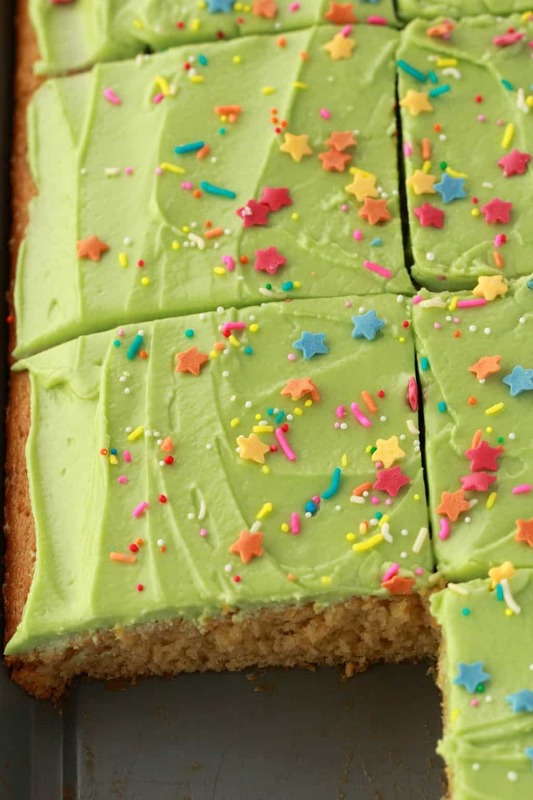 *You might not need all the soy milk in the frosting. This is how much I used but different brands of vegan butter have different water contents, if your brand has a higher water content than the one I used, you may not need to use as much soy milk. It’s a good idea to add it in slowly and only as much as needed. 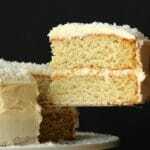 *This recipe can adapt to an 8-inch round layer cake. Just spray two 8-inch cake pans with non-stick spray and line the bases with circles of parchment paper. Divide the batter between them and bake for 30 minutes. *Adapted from our Vegan Vanilla Cake. Absolutely lovely! Ideal for a party or just teatime! Made this last night… Used almond milk and avocado oil instead and added fresh vanilla bean. It turned out sooooo yummy. There wasn’t any left! This is my go to… and so easy! Thank you! 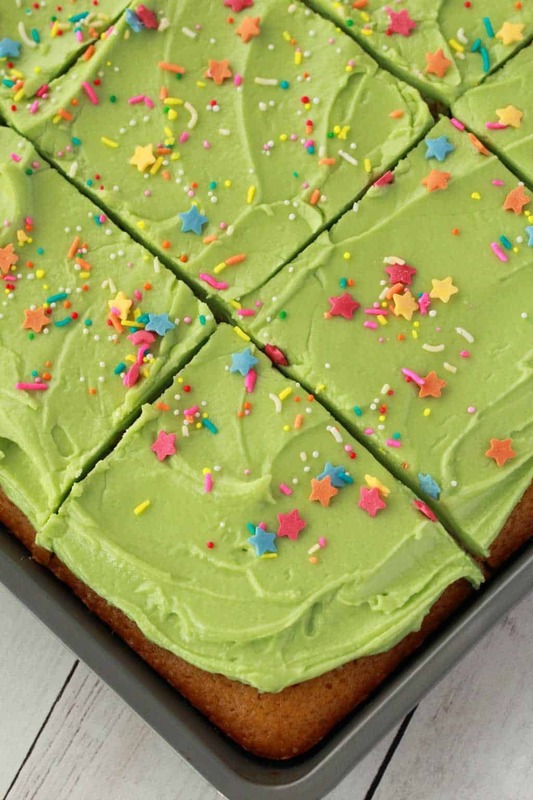 Love this idea – I’ve never tried a making a vegan cake before. Have always wanted to, and now I want to start to, start to transition to veganism. 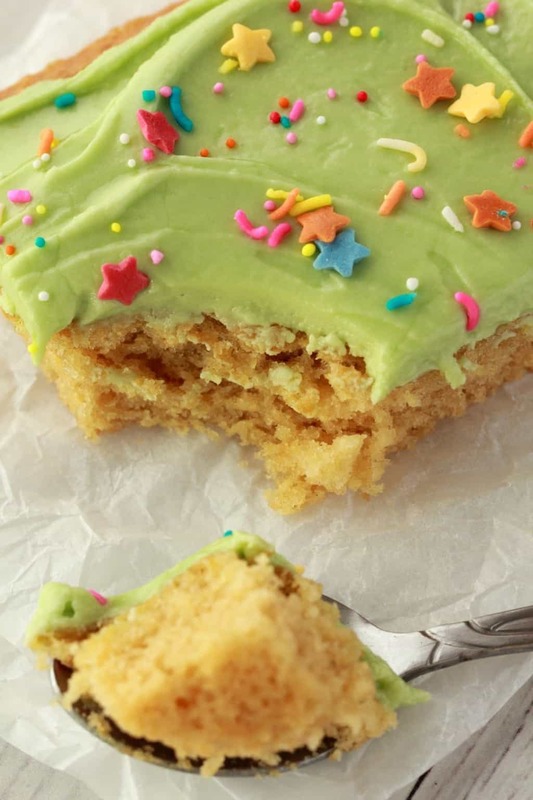 Just wondering, is it okay to replace the sugar with ripened bananas and use just peanut butter as the frosting to make a peanut butter banana sheet cake? And I make my own soymilk, so I was wondering if my homemade soymilk instead of bought soy milk would make any difference. Would appreciate a reply! Thanks for the recipe idea though! Thanks for sharing! What ingredient the bonding agent, kind of like eggs would be in a non-vegan? Hi was wondering if I can use apple cider vinegar? no flax seed ???? if used won’t it rise more = ??? No, this gets a perfect rise. Can I use oil instead of coconut oil. My husband has heart condition and cannot have coconut oil. Love your recipes. Moist. Delicious. Super easy. A winner! 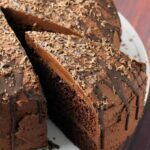 This is the perfect recipe for me since I’m looking for a vegan cake recipe without nuts and seeds. Thank you Alison. I’m going to make this for my grandson’s 2nd birthday this week. I used the white cake recipe in your 7 inch tins last year & everyone liked it. My family is not vegan but my grandson is allergic to eggs. I ordered an edible PJ Masks topper . 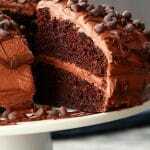 I found on a comment that you have this sheet cake. So I’m trying it tomorrow for a 4th of July party & I’ll use my9x13 pan & see how it turns out & I’ll make another one Thursday for the Birthday party. Hi how would this be modified for a gluten free/grain free flour? Though I’ve done a little gluten-free baking and you can check out my gluten-free cakes, that is not my specialty and I can’t advise for gluten-free on all cakes. All the best! Thanks for this! I followed your advice (on the page for your Vanilla Cake recipe) and used this sheet cake recipe in two 8” round tins to make a 2-layer birthday cake today. It turned out great, even though I was a bit worried there wasn’t enough batter when I put them in the oven. I baked for 35mins and they puffed up a lot, enough that I was able to flatten the tops a bit with a bread knife after they cooled! Recipe was so easy, mostly with stuff we already had in the pantry. Hi, thanks for the recipe. I need to make a sheet cake for a large gathering. Would like to make it with a filling too. Should I cut in half and fill or should I make 2-3 cakes, fill & layer? Does this crumble when you cut it? I have that issues with a lot of eggless cakes I bake. Please respond promptly as I have to make this on the weekend. Hi! 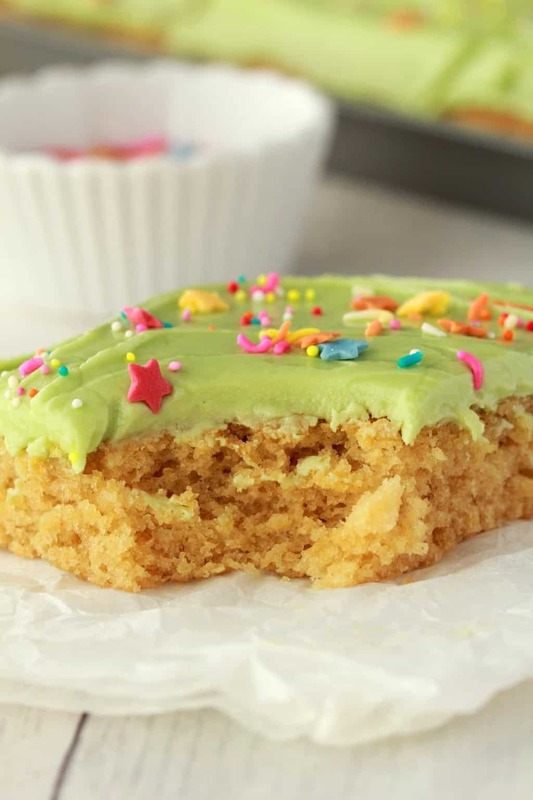 Have you ever tried freezing the cake (before frosting) so that you can make it in advance? I do this with standard cakes to make frosting a bit easier. Never made a vegan cake before so I wasn’t sure if that would work! This recipe turned out perfectly. Thank you! Was just testing this recipe before actually making a cake for a baby shower. We have a severe dairy allergy is our office, and I am always trying to find recipes that are safe for her to eat. I used coconut oil and coconut milk in place of the olive oil and soy milk. It is so delicious. I do have one question. I need to make a rather large cake. Does this recipe quadruple well, or should I mix in separate batches? I am making a 10 in three tier cake. Thank you for the recipe and your help!